A Scots schoolboy has been praised by airport bosses after inventing a gadget which could help prevent plane crashes. Daryn Murray's Aircraft Debris Protector warns pilots of dangerous material lying on runways before they prepare to land. The 12-year-old from East Kilbride was inspired by the Concorde crash near Paris which was thought to have been caused by a metal strip on the runway. The British Airport Authority (BAA) is keen to develop the idea. The operator, which owns Glasgow, Edinburgh and Aberdeen airports, believes it could make runways extra safe. The detector works by using a camera attached to a remote controlled device which rolls along a small track on the side of the runway. The camera is able to pick out images of any potentially dangerous debris from the ground and send warning messages to aircraft using the runway. 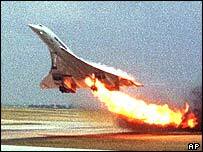 The French Concorde crash in 2000 was believed to have been caused after a tyre was punctured by debris. Daryn entered his gadget into the Young Engineers for Britain competition at Hampden Park on Friday. Daryn said: "My uncle is a pilot and I'm really into planes. I decided I wanted to try and make something that would make people more confident about flying and help out pilots too. "The machine can detect debris up to as small as a nut." 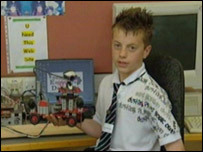 The Duncanrig Secondary pupil, who wants to be a mechanical engineer, added: "I'm really pleased with it." BAA Scotland's engineering director Colin Crichton, who chaired the judging panel, said it could add to the runway inspection process. He said: "Daryn's idea could offer an additional safety measure, and we're keen to speak to him about how he can develop his idea. "We'll be inviting him to Glasgow Airport to go behind the scenes and meet the team who safeguard the runway." David Aitken, head of craft, design and technology at Duncanrig Secondary, said: "It does appear to address a need. "It attracted a lot of interest with the judges but needs to be developed a bit further. "It wouldn't take a great deal of investment to install this in airports - Daryn's model was made for around £100. "I think there will be more contact between BAA and myself in the future."